Development of the imaging modality to noninvasively provide diffraction-limited images of biological samples is one of the most important goals of modern microscopy. This problem is challenging because biological objects are complex structures of irregular optical properties. They diffuse the light rays similarly as water droplets in the fog (see left panel). As a result, the sample, a biological object, cannot be correctly imaged. Instead, the image is usually distorted as shown in the right panel (distorted image). To overcome this problem we developed custom technique of light modulation (STOC), which purposely modify the incident light such that the sample image can be recovered, even in the presence of strong perturbation. More formally, STOC aims at diagonalizing the so-called, scattering coherency matrix. It quantifies similarities between scattered optical fields. We found that strong correlations, the non-zero off diagonal elements of this matrix are related to image distortions. When these correlations are suppressed, the sample image can be recovered. This method is particularly useful for biomedical imaging since it does not require calibration as competitive techniques. The light scattered from biological objects encodes an information not only about the structure of the sample but also about its dynamical properties. Traditionally, the dynamics can be decoded from analysis of the field autocorrelations. The faster movement, the steeper decay of the autocorrelation. This physical property lies grounds for many instruments, spanning from wearable devices for heart rate monitoring up to brain oximeters. The measurement of dynamics with optical coherence microscopy (OCM) can be used to determine and track movement and speed of the particles at the microscopic level at high speed. So, biological processes can be monitored nearly in the real-time. 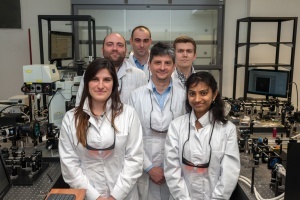 In this project we develop optical instruments to analyze microscopic dynamics of intracellular organnells in vivo, which can be of great importance to study cellular processes. Brain is the key element of central of the nervous system in all vertebrates. It has the complex structure of neurons connected by synapses to axons. Axons (especially myelinated) play an important role in the workings of the neural circuits since they are responsible for the rapid and faithful transmission of electrical nerve impulses between synapses. A debility of signal transmission detrimentally affects many cognitive, sensory and motor functions. Another important aspect of a proper brain function is cerebral circulation. Cerebral blood flow (CBF) delivers nutrients such as oxygen, glucose and removes metabolic by-products. Hence, CBF defects lead to serious brain dysfunctions like stroke. Therefore, noninvasive techniques for brain imaging may help in characterizing diseases of the central nervous system and diagnosis of stroke and other CBF dysfunctions. The goal of this project centers around noninvasive brain imaging to monitor functional CBF changes and blood vessel structure under the stroke induced in the mouse brain. We developed an optical instrument, enabling for noninvasive, real-time monitoring of CBF and stroke induction with the single modality. Optical coherence tomography is a non-invasive imaging modality generating micrometer resolution, two-dimensional cross-sectional images and three-dimensional volumetric data on the internal structure of optically scattering and reflective samples. Most of the reports on OCT are confined to the visualization of structural architecture of the objects by measuring the amplitude of the back-scattered light. However, the OCT extension techniques enabled demonstration of different contrast mechanisms that rely on application of endogenous or exogenous contrast agents. One of the emerging methods utilizes temporal modulation of the excitation light. The absorption of photons by a chromophore generates a modulated heat wave that is detected as an optical path length changes (photothermal signal). Recent reports showed different approaches to make photothermal imaging more feasible for in vivo imaging. 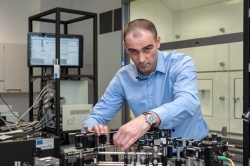 The aim of our study is to develop the OCT-based interferometric technique combined with optical lock-in for ultrasensitive detection of nanoparticles. The proposed approach, called Dual Optical Lock-In, is based on the detection of optical signal beating that allows for maintaining high frequencies of photothermal effect modulation and high detection sensitivity. We applied modified Spectral OCT system with photothermal excitation to visualize thin layers of nanoparticles in developed specimens.